In this Maiev Build Guide, we provide an overview of her strengths, abilities, talents and matchups. For many months, and largely on the back of new Overwatch Heroes arriving into the Nexus, mobility creep is a very real problem in Heroes of the Storm. As the likes of Genji and Tracer run rings around older, more static Heroes, a counter was desperately needed. While some Heroes can briefly stop the sheer speed and agility of such mobile Heroes, it's only briefly. Often times, it's still not enough and the windows of opportunity to punish them are incredibly small. With Genji having been top tier since his release, and Tracer still regularly drafted in competitive play, there had to be a solution. That solution, finally, is Maiev. As a melee Assassin, Maiev is designed to limit the mobility of opponents and punish them when they attempt to escape. Against the likes of Genji and Tracer, this puts her in an incredibly powerful position to shut them down quickly. With base Passive armor, a powerful tether and escape, she's undoubtedly a valuable addition to most compositions. What's also incredibly potent about Maiev is the fact that despite being a melee Assassin, she has some ranged threat and high cleave potential. Her Fan of Knives has a reasonable range and can trigger against multiple targets, while Umbral Band is also capable of hitting more than one opponents. This allows her to take camps with ease, clear waves comfortably and pressure any group that's too close together. While I anticipate Maiev to have a high ban rate, she's undoubtedly a powerful addition to Heroes of the Storm and one that will likely transform the meta. Vault of the Wards (Trait) - Acting as an invulnerability frame (or i-frame for short), Vault of the Wards is incredibly powerful and I would argue, one of the strongest Traits in the game. In essence, when you active Maiev's Trait, it allows her to mitigate all incoming damage during that brief window. Effectively, anything that is throw at her while she's leaping into the air is negated. In many ways, it acts like a brief, but quicker version of Ice Block. What's so powerful about Vault of the Wards isn't just the fact it allows Maiev to avoid critical attacks (such as Illidan's The Hunt or Varian's Colossus Smash), but that it has such a low cooldown. Being able to use it every 13 seconds, with no mana cost, makes it incredibly useful. Fan of Knives (Q) - With a low base cooldown and relatively cheap mana costs, Fan of Knives is good for softening up minion waves and camps. It's primary use however is allowing Maiev to quickly hit multiple Heroes at once, allowing her to reduce its cooldown to 0.5 seconds, while refunding the mana cost. As long as she hits 2 or more Heroes at the same time, she'll gain the bonus. Triggering the near instant reset is imperative for not only dealing high AOE damage, but keeping up the sustained pressure against her opposition. Umbral Bind (W) - Part of the reason why Maiev is so strong versus mobile Heroes, Umbral Bind allows her to tether herself to an opponent for 2.5 seconds. Any attempt made to escape the tether results in them being yanked back to Maiev, before suffering damage. With Umbral Bind activating on your next melee swing, it's important to time it right. Ideally you want to use it them moment the likes of Genji of Tracer get a little too close for comfort. Once you've tethered yourself to a foe, you should punish them as much as possible while using Vault of the Wards to evade any damage they try to deal to you. Ideally you also want to tether yourself to a squishy Hero, not a "tanky" one. The likes of Leroic, The Butcher or Varian can punish you with ease if they're linked to you. Spirit of Vengence (E) - As your only form of mobility, Spirit of Vegence has several uses. Allowing Maiev to dive deep, to then swap with her shadow to appear immediately next to a foe, it can also be used to evade attacks or to simply retreat. Capable of dealing damage to minions, it deals 100% bonus damage to Heroes. If aimed correctly it can still cut through several Heroes at once if they aren't quick to move. With a relatively long cooldown, Maiev can't really afford to waste this ability. In addition, skilled players will target their abilities to where Maiev will blink to, so be careful when traveling to your shadow, especially against the likes of Kael'thas or Li Ming. Finally, Spirit of Vengence can be used to force the stun effect of Umbral Bind. Simply tether someone, use Spirit of Vegence instantly at maximum distance, and they'll be yanked away. Containment Disc (R) - My preferred Heroic for Maiev, Containment Disc is somewhat similar to Anub'arak's Cocoon. Allowing her to throw her Glaive at a single enemy, Containment Disc can then be reactivated at Maiev's choosing to place the affected player in stasis. During this time their vision is removed and they're unable to do anything for 4 seconds. To remove a single Hero from a fight for a considerable period of time, it's absolutely incredible. If you can land it on a Support Hero, or the main "tank", it'll allow your team to participate in any fight without too much risk. Warden's Cage (R) - Proving particularly powerful on Battlegrounds where you fight over a single objective (such as Towers of Doom or Infernal Shrines), Warden's Cage allows Maiev to trap one or multiple enemy Heroes in with her and her team. Any enemies who try to escape are bounced back inwards, consuming one a Warden in the process. Fundamentally, enemies who are trapped have to hit a Warden to leave, or remain in the center until the Wardens expire (the cage lasts 5 seconds). At the very least, you'll trap enemies for 1.5 seconds, and even if they do quickly bump a Warden to consume it, it'll still offer you another second of damage against they as they get bumped back. If you can, take Warden's Cage when playing with Heroes such as Kael'thas or Blaze, to maximize your AOE damage. 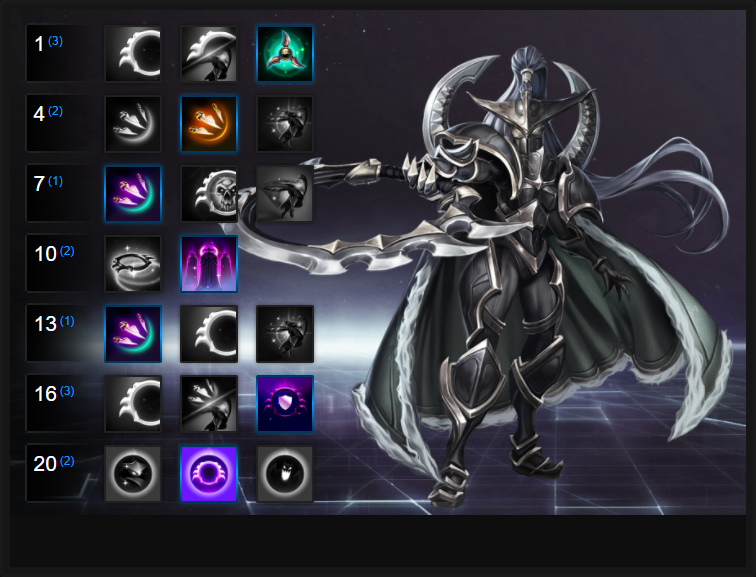 Like our Maiev build guide? You can help support its updates by subscribing to Ten Ton Hammer. Here's the details. Naisha's Memento allows Maiev to gain an active ability, allowing her basic attacks to bounce towards nearby enemies, similarly to Li Li's Cloud Serpent. With her attacks able to bounce twice, dealing 30% more damage, Naisha's Memento allows Maiev to deal massive AOE damage (especially when combined with Fan of Knives). Best of all, the active ability is recharged if you hit 2 Heroes with a single Fan of Knives. Blade Dance allows Maiev to deal AOE damage every time she uses Fan of Knives. While the base damage isn't enormous, it scales to around 130 damage at level 20. Considering how quickly you can release Fan of Knives against multiple foes, it acts as a high damage DOT. Variable: If pursuing pure ability damage, Pin Down offers Maiev the opportunity to significantly bolster the damage of Fan of Knives. The downside to this is the fact you need to hit 3 Heroes to gain the rewards. That said, during team fights this is fairly easy to achieve. Hitting 3 provides a 15% damage increase, while each additional 3 Heroes hit grants a further 5% damage bonus, up to 30% (45% in total). What's also interesting about this Talent is the fact if you hit 4 Heroes at once, you can complete the quest instantly. On small Battlegrounds where players fight at the start of a match, you can sometimes zip through every reward. Providing Maiev with bonus damage when she hits enemies with Fan of Knives, Elune's Wrath triggers when Maiev hits 2 or more enemy Heroes. When she does, her next Fan of Knives will inflict additional damage. While the damage isn't huge, the fact Fan of Knives has such a short cooldown ensures she can trigger it constantly, significantly improving her AOE pressure. Providing incredible team-wipe potential, Warden's Cage allows Maiev to keep multiple Heroes in one place for a lengthy period of time. Though it takes 1.5 seconds for the Wardens to appear, as long as Maiev keeps enemies tethered and places it correctly, it can often result in massive casualties for the opposition. I've had a lot of good fortune with Bladed Armor and found it easy to maintain and maximize. Providing Maiev with 5 armor every time every time she hits a Hero, it lasts up to 5 seconds and caps at 20. Considering Fan of Knives has a 4 second cooldown, even if you do hit just one Hero at a time, you'll still maximize it. If you hit multiple, and trigger the lowered cooldown on Fan of Knives, you can cap your armor near instantly (bringing you to 30). Armored Assault grants Maiev a 20% damage bonus to all her attacks and abilities when she has more than 10 armor. With Bladed Armor and her 10 passive armor, she can maintain Armored Assault permanently the moment she gets into combat. Allowing Maiev to gain 40% attack and movement speed for 5 seconds, Shadow Orb: Huntress allows Maive to chase and attack at incredible speeds. Best of all, it also ensures Naisha's Memento gains maximum up time once it's activated. Variable: For pure burst, take Shadow Orb: Shadow Strike. It causes causes Maiev to deal instant damage to an opponent, slow them by 30% and reducing their armor by 20%. Combined with Armored Assault, it allows Maiev to deal massive damage and grants her the ability to quickly burn down an opponents health. These Hero Threat Levels (1 being lowest threat and 10 being highest threat) are to help you determine which enemy Heroes can give you a headache. For the Heroes listed here, take extra care as they're particularly dangerous for Maiev. This list of tips and tricks are just a handful of things we think will help your Maiev play. We'll continue to add to the list as required and if you have any tips you'd like to share, let us know in the comments below and we'll place them here. 1. Your Trait allows you to avoid ALL incoming damage - from any basic attack or ability - for 0.75 seconds. This can allow Maiev to mitigate a huge amount of damage. Best of all, it's on a very short cooldown. 2. Always try to use your Trait to avoid high damage abilities, such as Colossus Smash or Go For The Throat. Avoiding basic attacks is fine if it'll save your life, but those big-hitters are far more important. 3. Fan of Knives has an arc-shaped telegraph you have to manually position. It takes a little while to get used to, but does put you in a position to use it exactly where you want it, in order to trigger two hits against Heroes. 4. Fan of Knives has a very low mana cost, so don't worry about using it to soften up a minion wave. 5. For maximum damage, you have to hit two or more Heroes with Fan of Knives to ensure Maiev can constantly apply AOE pressure. She's strongest on Battlegrounds that constantly require group fights (such as Braxis Holdout or Towers of Doom). 6. Umbral Bind can tether multiple Heroes as it causes Maiev's next basic attack to cleave. Try to snag one or more every time. 7. You can instantly force a stun against one or more targets with Umbral Bind by tethering them, before Blinking away with Spirit of Vengeance. 8. Spirit of Vengeance deals the same damage on the way out, as it does back. The only difference is the damage is increased by 100% against Heroes. Try to aim it through as many as possible, and reposition so that the return boomerangs back against your opponents. 9.As long as Spirit of Vengeance is active, you can Blink back to it. Don't feel the need to, but instead treat it as a means to confuse your opponents if you need to escape. 10. Once an enemy is hit by Containment Disc and suffering the Time Stop, you cannot do anything to them until it ends. You also cannot end the effect early. 11. Containment Disc can be activated immediately once it impacts on a target, or by itself after a delay. Thanks for reading our Maiev build guide. You can help support its updates by subscribing to Ten Ton Hammer. Here's the details.